my name is Cheri and I am a Glassaholic! The term Depression Glass refers to manufactured glassware that was produced from the 1920's, through around the early 1940s, ie. the era of the Great Depression until the end of WW2. Quaker Oats for five Railroad Cars of glass. caused the straw to burn! and so is an unlikely scenario. Instead, it is more likely that these marks were the result of the instruments used to remove the mold from the glass. These very flaws in the manufacturing process are interestingly now what distinguishes genuine Depression Glass from modern reproductions, and so gives it a higher value! The lovely Elegant Glass or Elegant Glass of the Depression Era maintained a higher quality of glass, as well as a more refined manufacturing process and pattern style, with beautiful etchings and workmanship. It was more expensive than it's cheap and colorful cousin, and certainly not given as freebies, and was thus favoured by wealthier customers. Elegant Glass was mainly handmade... either pressed, blown or a combination of both (mold blown). 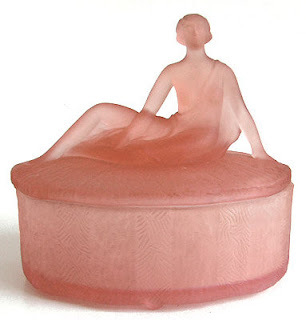 The mold blown glass was first heated in a glory-hole opening in a hot furnace and then put in a mold, either by pressing or blowing. After removing it from the mold, the piece was often crimped, flared, or cupped to add artistic flair. Handles, feet or special ornamentation were also frequently applied. After working it to a desired shape, it was put back into the glory-hole to establish it’s final color. One of the last steps in the glass-making process was to fire polish the piece, where the glass was re-heated to remove any mold seams and to give it extra clarity. Some companies further ground and polished the bottom to allow it to have a smooth surface. Etched pieces had many labor intensive steps following the glass-making process. The patterns that were etched were usually found on several types of blanks, giving the customer a wide range of choices in building their set. 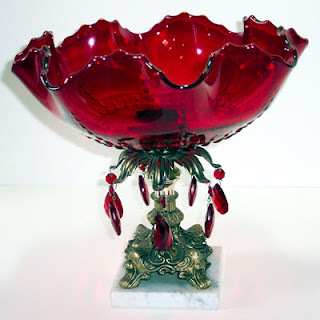 Elegant Glass was sold in fine department and jewelry stores that also carried good China and Silverware patterns, allowing customers to mix and match their selections according to preference. Although some Elegant Glass was made in colors, usually pastel, it was predominantly clear glass (aka crystal, which refers to it's color rather than it's purity), which was preferred by the wealthier customers who purchased this finer quality glassware. Immediately preceding the years of the Great Depression, there were well over 100 companies manufacturing glass in the United States, with most of them located in the mid-western United States. By the time the Depression ended, less than fifty remained. Bankruptcy, mergers and fire were the major reasons that companies ceased operations. 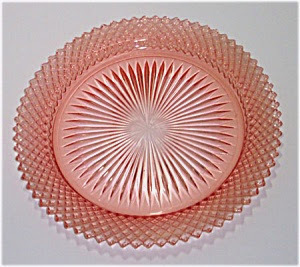 Some of the larger and better known Depression Glass companies were Federal Glass, Paden City, MacBeth-Evans, U.S. Glass, Hazel-Atlas, McKee, Lancaster, Hocking (later Anchor Hocking), and Jeannette. The smaller companies of that era included Bryce, Bartlett-Collins, Standard, Dunbar, and Monongah . British companies like Bagley and Sowerby also produced beautiful patterned glassware during this period. All of these companies produced a vast array of glass in many different colors, patterns and styles, with entire tableware and household ranges that included all sorts of plates, cups, bowls, pitchers, tumblers, goblets, butter dishes, cookie jars, perfume bottles, candlesticks, cruets, coasters and so much more. is broadly defined as the art movement involving a mix of modern decorative art styles of the 1920s and 1930s, and derived from various avant-garde painting styles of the early twentieth century. Art Deco exhibits aspects of Cubism, Russian Constructivism and Italian Futurism, with abstraction and simplification, particularly with geometric shapes and highly intense colors celebrating the rise of commerce, technology, and speed. The growing impact of the machine can be seen in repeating and overlapping images from 1925 - 1930s, with streamlined forms derived from the principles of aerodynamics.